Believe it or not, the Swedish giant IKEA can fit comfortably into your Danish Modern home with elegant, reliable, and useful pole shelving systems such as Stolmen and Broder. The Stolmen modular shelving system, designed by Ehlén Johansson, was originally conceived of as a wardrobe or closet storage solution, but quickly became a favorite canvas at places like IkeaHacker, where it was modified to store media and bicycles, among many others. IKEA has since released media accessories for the Stolmen unit. A more heavy-duty option is the Broder storage system, designed by Nicolas Cortolezzis and Olle Lundberg, which uses galvanized steel where Stolmen uses fiberboard, plastic, and aluminum. The Broder unit is also available as a free-standing piece with L- or T-shaped legs as well as in compression pole form. The newest additions to Ikea’s modular shelving system lineup are the Änga series, designed by Eva Lilja Löwenhielm, which looks to echo the materials used in the Stolmen line with the shape of an ISS or Rakks system, and the Antonius, designed for clothes storage. 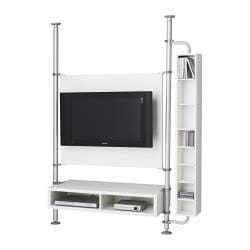 We’ve used the Stolmen for media storage with good effect–anyone have experience with the Broder, Änga, or Antonius lines? This entry was posted on Sunday, May 4th, 2008 at 4:19 pm	and is filed under Shelving, Source, Tension Poles. You can follow any responses to this entry through the RSS 2.0 feed. You can leave a response, or trackback from your own site.